Publisher: J. Rozez, Bruxelles, 1871. Condition: Hardcover, half-leather, in good condition for their age. Ornate gilt to spine, a bit of wear especially to corners of boards, but a very handsome set, firmly bound. All text is in the original French. Giacomo Girolamo Casanova (1725 – 1798) was an Italian adventurer and author from the Republic of Venice. His autobiography is regarded as one of the most authentic sources of the customs and norms of European social life during the 18th century. He has become so famous for his often complicated and elaborate affairs with women that his name is now synonymous with “womanizer”. He associated with European royalty, popes and cardinals, along with luminaries such as Voltaire, Goethe and Mozart. He spent his last years in Bohemia as a librarian in Count Waldstein’s household, where he also wrote the story of his life. As was not uncommon at the time, Casanova, depending on circumstances, used more or less fictitious names such as baron or count of Farussi (the name of his mother) or Chevalier de Seingalt (pronounced Saint-Galle, as in French). 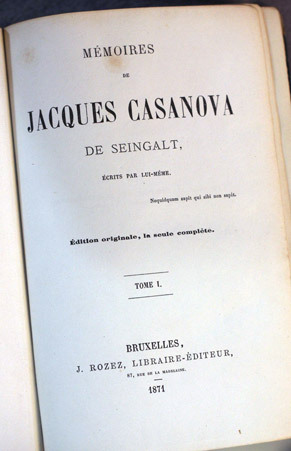 He often signed his works Jacques Casanova de Seingalt after he began writing in French following his second exile from Venice. Although Casanova was Venetian, the book is written in French, which was the dominant language in the upper class at the time. The isolation and boredom of Casanova’s last years enabled him to focus without distractions on his autobiography, without which his fame would have been considerably diminished, if not blotted out entirely. 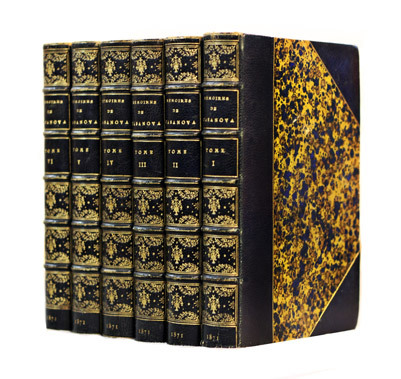 He began to think about writing his memoirs around 1780 and began in earnest by 1789, as “the only remedy to keep from going mad or dying of grief”. The first draft was completed by July 1792, and he spent the next six years revising it. He puts a happy face on his days of loneliness, writing in his work, “I can find no pleasanter pastime than to converse with myself about my own affairs and to provide a most worthy subject for laughter to my well-bred audience.” His memoirs were still being compiled at the time of his death, his account having reached only the summer of 1774. A letter by him in 1792 states that he was reconsidering his decision to publish them, believing that his story was despicable and he would make enemies by writing the truth about his affairs. But he decided to proceed, using initials instead of actual names and toning down the strongest passages. He wrote in French instead of Italian because “the French language is more widely known than mine”. I begin by declaring to my reader that, by everything good or bad that I have done throughout my life, I am sure that I have earned merit or incurred guilt, and that hence I must consider myself a free agent. … Despite an excellent moral foundation, the inevitable fruit of the divine principles which were rooted in my heart, I was all my life the victim of my senses; I have delighted in going astray and I have constantly lived in error, with no other consolation than that of knowing I have erred. … My follies are the follies of youth. You will see that I laugh at them, and if you are kind you will laugh at them with me. I expect the friendship, the esteem, and the gratitude of my readers. Their gratitude, if reading my memoirs will have given instruction and pleasure. Their esteem if, doing me justice, they will have found that I have more virtues than faults; and their friendship as soon as they come to find me deserving of it by the frankness and good faith with which I submit myself to their judgment without in any way disguising what I am.